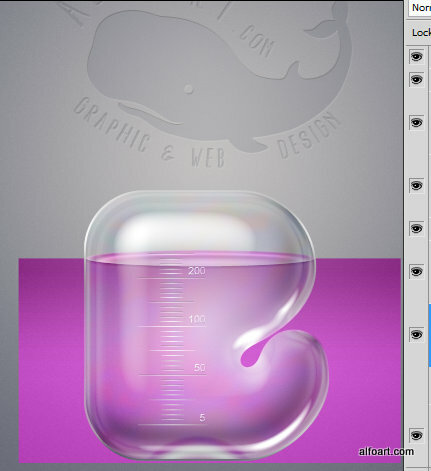 Learn how to create cute and funny Laboratory Glassware Letters Realistic glass text effect. 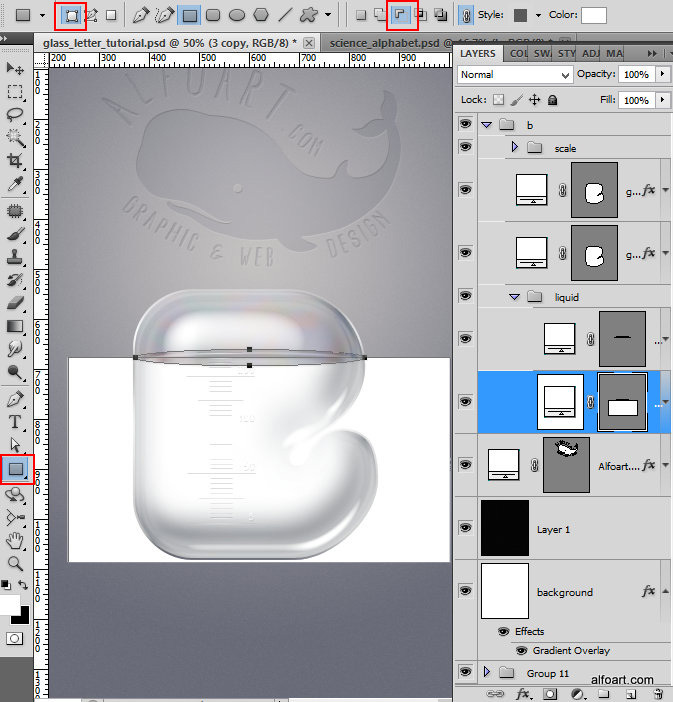 This Adobe Photoshop tutorial teaches how to apply octopus skin texture and light reflections to the 3d letters. 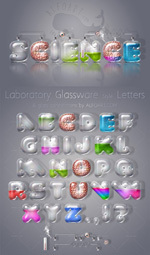 Laboratory Glassware Letters. Realistic glass text effect. Learn how to create realistic glass text effect by using very simple tools and techniques such as layer style effects and blending modes. 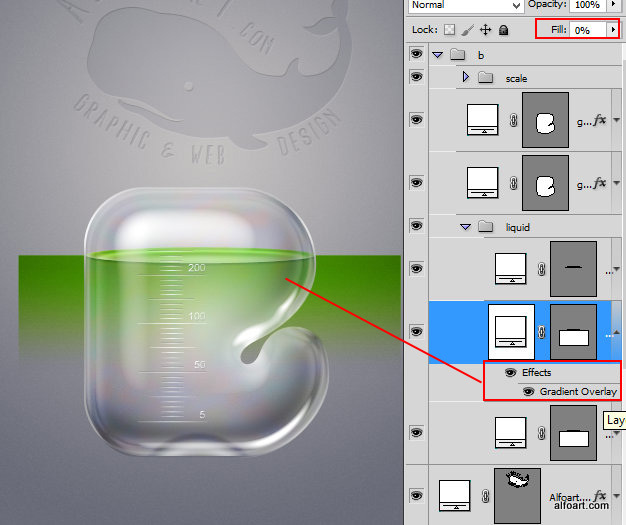 This Adobe Photoshop tutorial teaches how to apply transparent glossy texture to the letter shape, how to fill out laboratory glassware letter with the realistic liquid, water bubbles and steam. 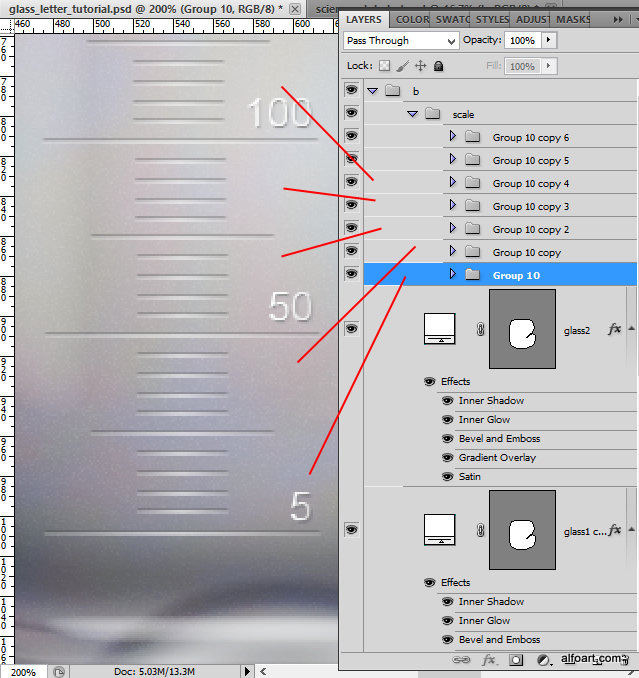 Also it shows how to add metric scale to the glass surface, how to make shadows and reflections. 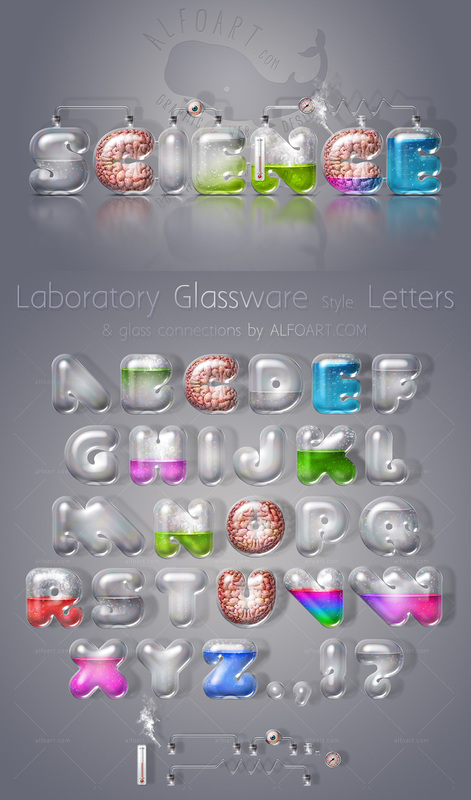 You may get two large, high resolution and fully editable psd files "Laboratory Glassware Letters" with whole English alphabet (4200x4800px, 300px/in) and "Science Text Effect"(4000x2500px, 300px/in) file by making a payment. Click image on the left side to see all elements of both files. These files contain layered English letters, glass style pipes, corks, barometer, thermometer, realistic brain texture, eyeball and other elements. You will be able to use letters with different backgrounds for different chemistry laboratory style signs. 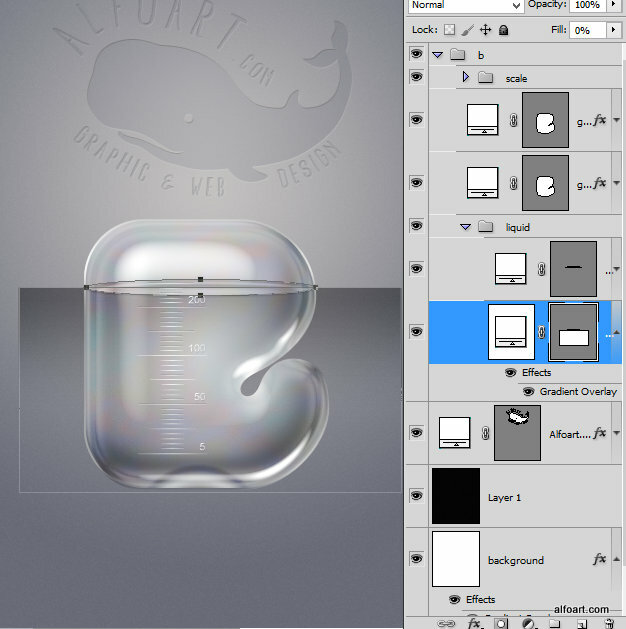 Learn how to create liquid inside of glass shape. 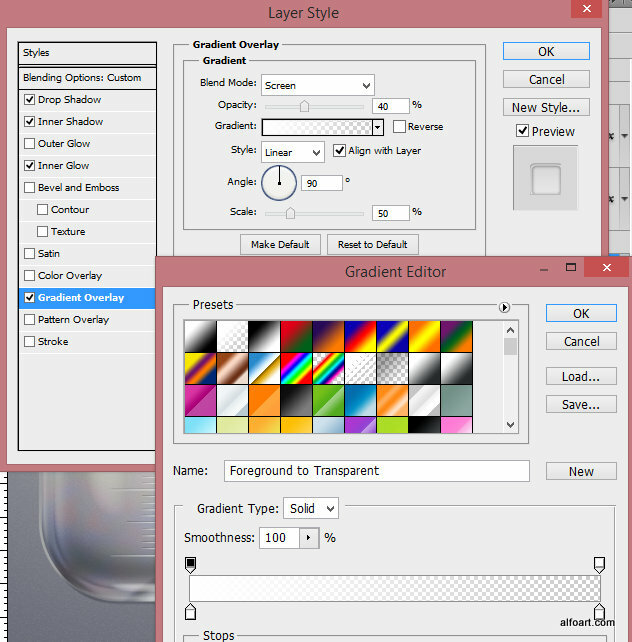 Create a new layer below glass shapes layers and put it into "Liquid" group. 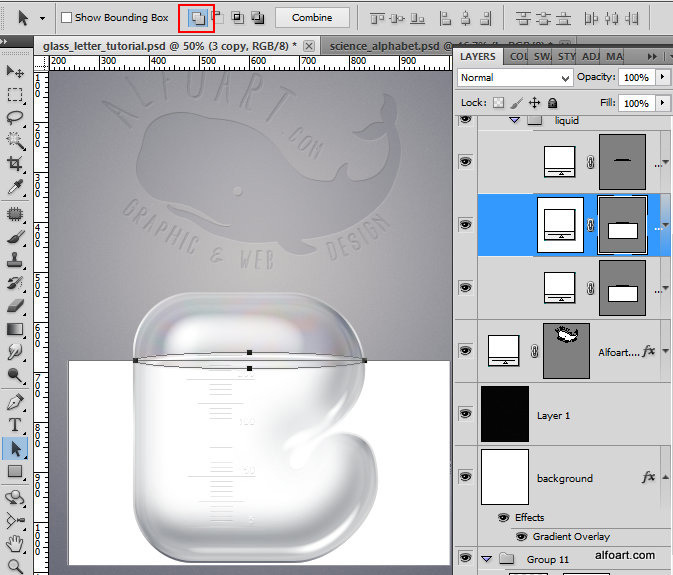 Take Ellipse Tool and create the oval shape. Apply Fill = 0% to the oval shape. 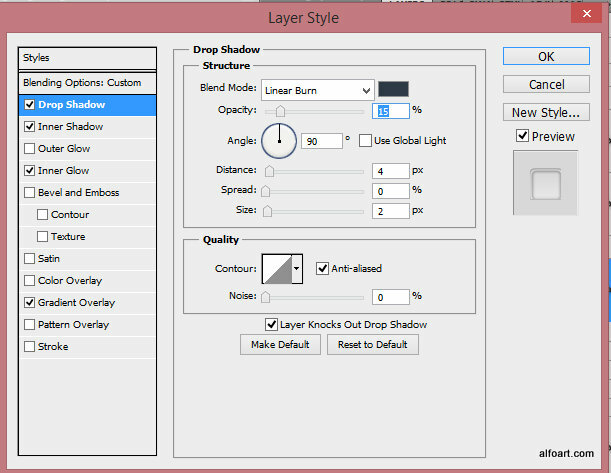 Choose Rectangle Tool and create rectangular below the oval layer. The top edge of rectangular should be in the center of the oval shape. 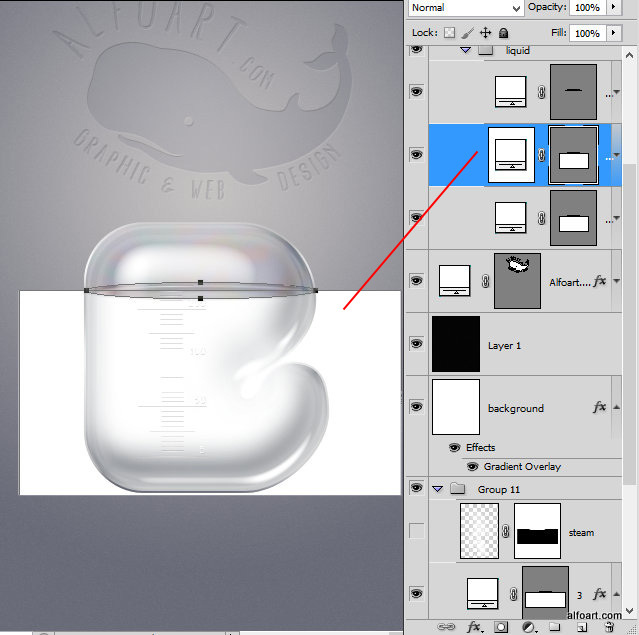 Return to the Oval shape layer , make oval path thumbnail active. Go to Menu > Edit > Copy. Return to the rectangular shape again and paste copied oval path. 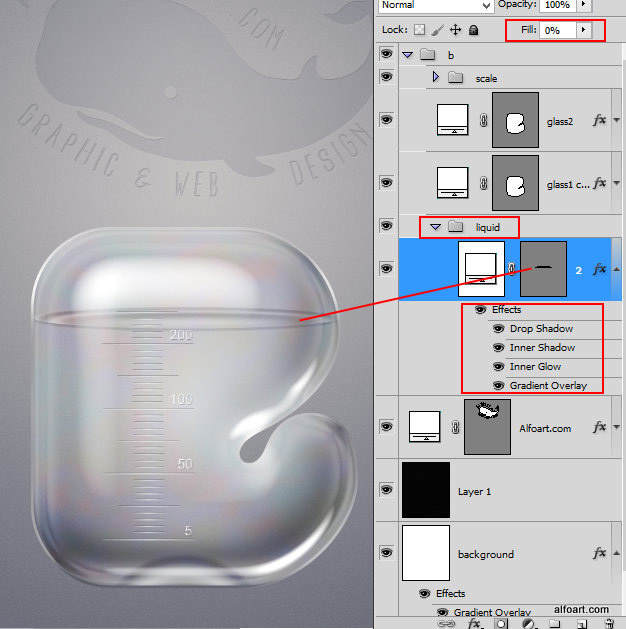 Click "Subtract from shape area(-)" icon. The oval area of rectangular should be empty. 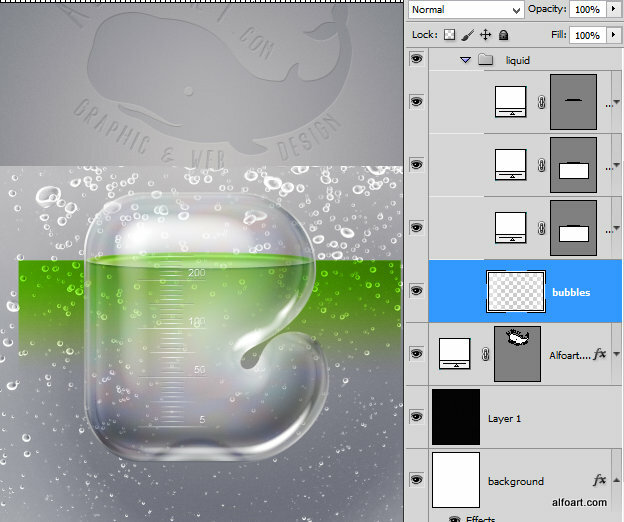 Apply Gradient layer style effect to created shape. 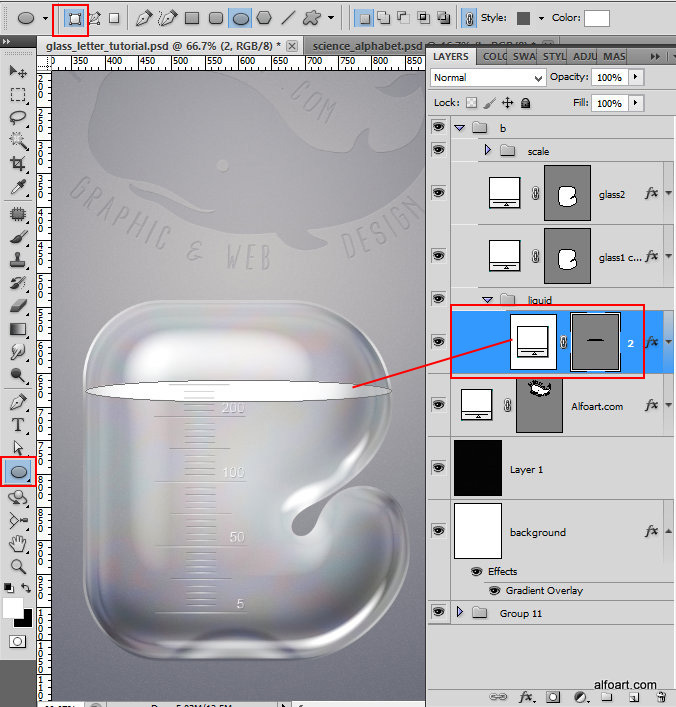 Make active oval path of the copied layer and click icon"Add to the shape area (+)". In this case you need to add oval area to the rectangular shape. Apply Fill = 0% and Gradient Overlay layer style effect. Use "Color" Blending mode to keep transparency. 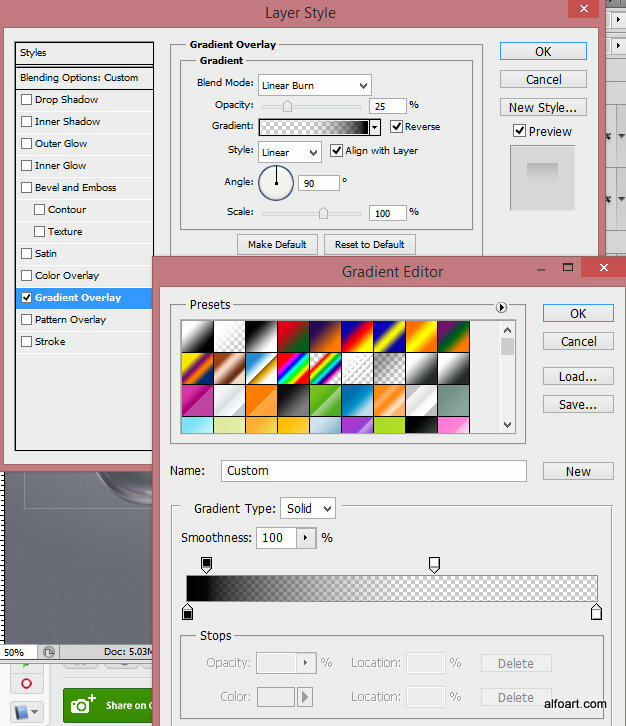 You may use different gradient to create another liquid color. 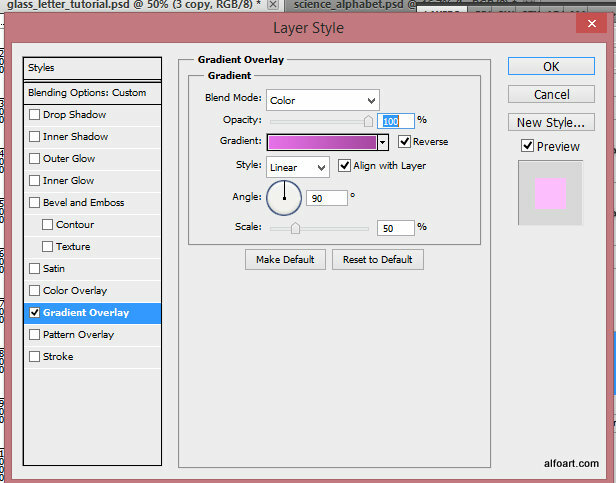 Here is example of using purple gradient. 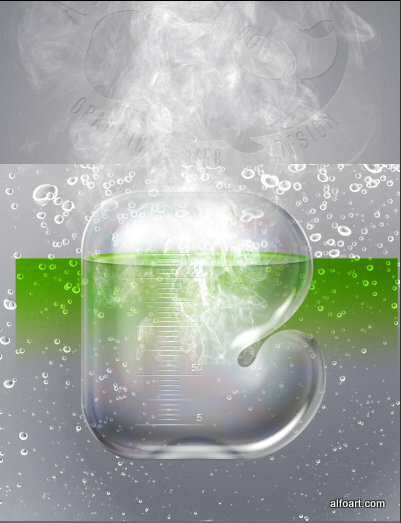 Lets return to our original green/transparent liquid and add some bubbles to it. 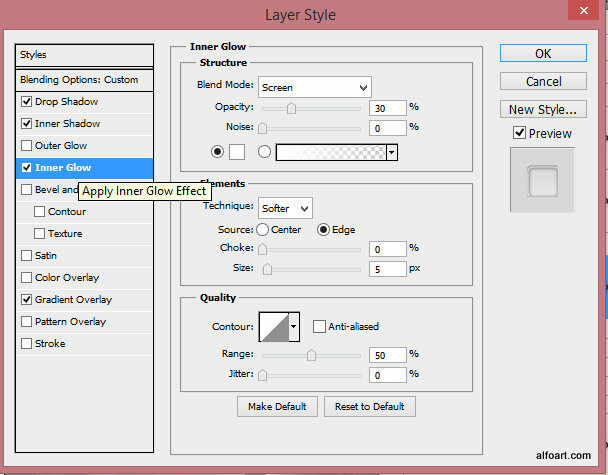 Put it below rectangular layers but keep this layer inside of "Liquid" folder. Insert Steam texture as well. 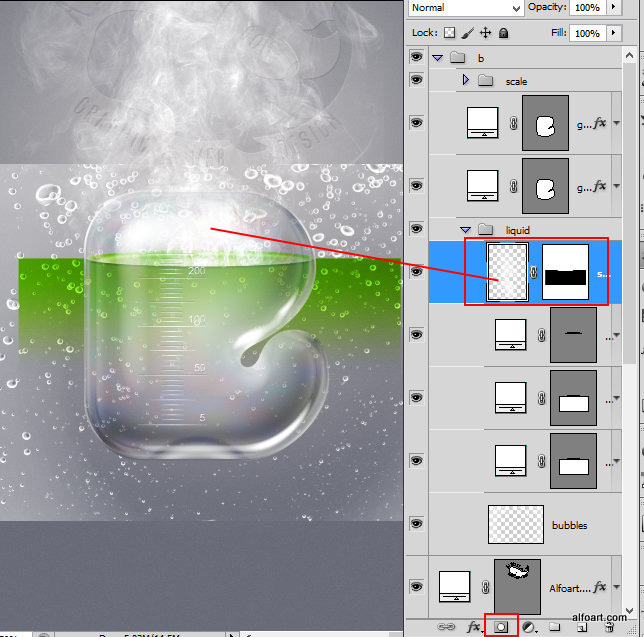 Place steam layer above all liquid layers and keep it inside of liquid folder. Load selection of the subtracted rectangular shape (Ctrl + click shape thumbnail). Go to Menu > Select > Inverse. 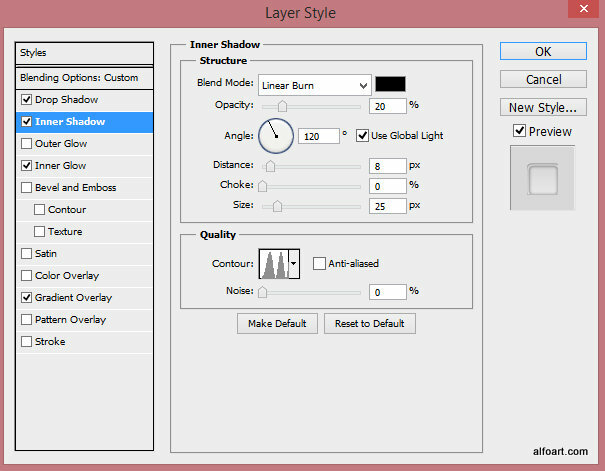 Then Click "Layer Mask" icon to add Layer Mask. You need to make steam area invisible inside of liquid area.